Changing your Subaru Car or SUV's engine oil and filter is the most important service that should be performed on regularly based on your vehicles scheduled maintenance plan. Even with high quality Subaru motor oil, heat and pressure from your Subaru's engine will degrade the performance of your engine oil over time and will need to be replaced. 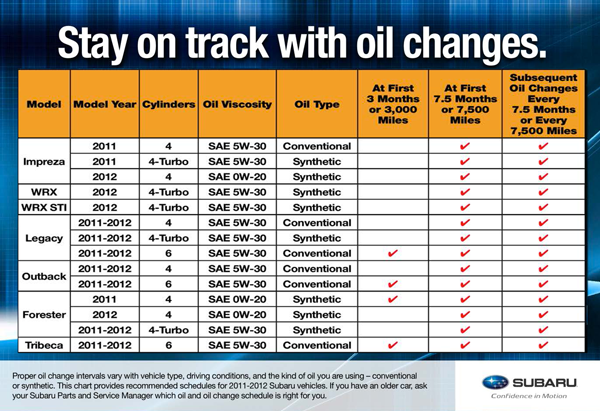 Subaru of San Bernardino would like to make you aware of Subaru's new recommended oil change intervals for 2011 and 2012 model year Subaru vehicles, so that your Subaru can run efficiently for years to come. By following Subaru's Recommended Scheduled Maintenance plan that came with your model Subaru, you can ensure that your Subaru car or SUV spends more time on the road, and less time in the shop. Subaru of San Bernardino's Service Technicians are Factory Trained and Certified, so you can rest easy knowing you are receiving the best possible service on your Subaru vehicle. 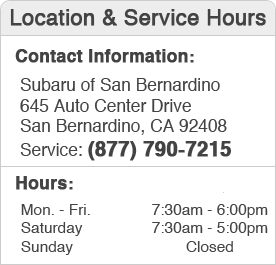 We encourage all Subaru drivers in Highland, Moreno Valley, Fontana, Riverside, and Ontario, California to keep up with your Scheduled Maintenance plan by vising San Bernardino's Service Department at regular service intervals. There are also many Service Specials and Parts Discounts available at San Bernardino to keep costs low for our customers. Please call or fill out our online form to set up an appointment today. We look forward to serving you.